This is the start of a series of lessons designed to help you build a solid foundation of life drawing skills, with the end goal being expressive drawings in your own style. We’ll go through a straightforward and doable drawing process and a set of exercises designed to help you develop the skills in those lessons. You can watch this lesson in this video, or read it below. 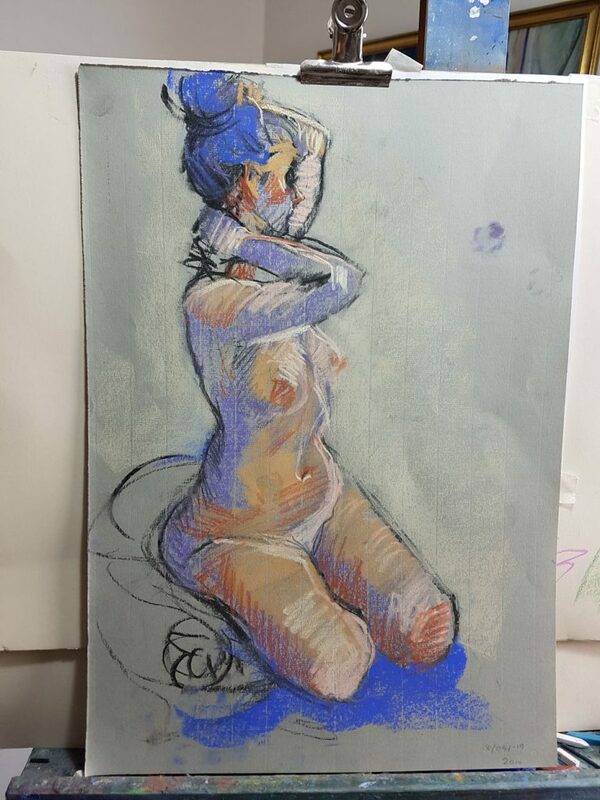 The lessons and exercises come from Mayko – an award winning artist and figure drawing expert, and me, a life drawing student that understands the challenges, because I’m still going through them everyday. 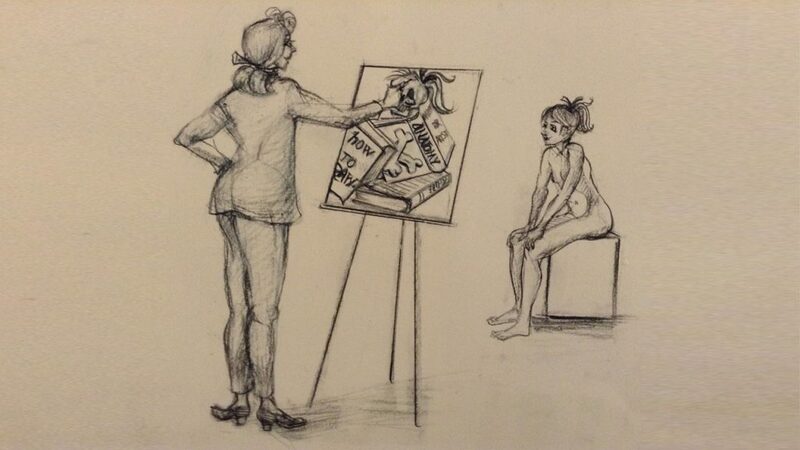 Example of Mayko’s life drawing. She uses vibrant colours and hatching, but the underlying structure is essential to the natural and lifelike feel of the drawing. That’s what we are concerned with in this course. 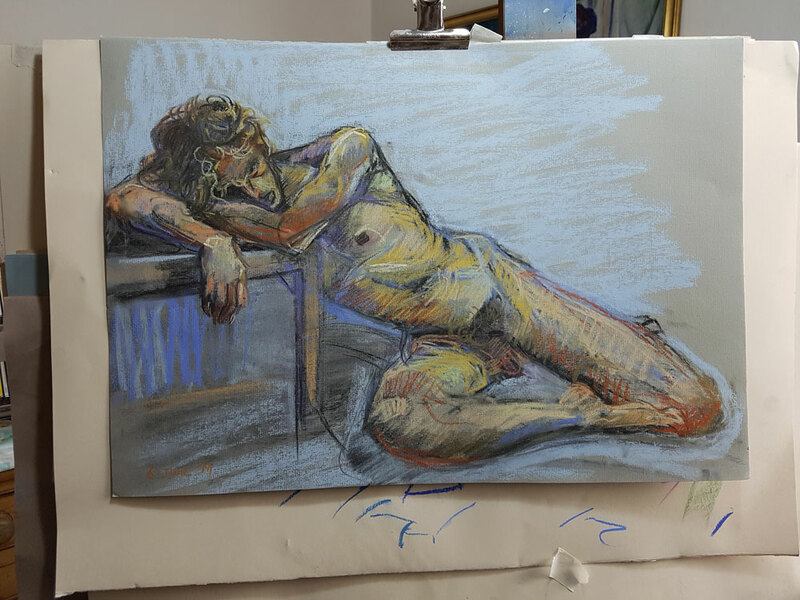 You’ll only really improve through practice, so to make the most of the mini-course, you’ll need to do the exercises and general figure drawing practice regularly. 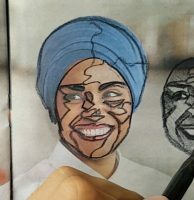 Before getting into drawing techniques, we need to talk about the learning process itself. With drawing, the information to practice time ratio is insane. It can take 10 minutes to take in a piece of how-to information, and then take hundreds of hours to actually be able to do that thing well. So if you take in a large variety of technical advice quickly, you are creating a huge burden of practice debt for yourself. The tricky thing is that there is so much information out there. Not only is there a large quantity, but a lot of it is advanced and requires a solid foundation before it’ll be useful. There’s videos detailing expert artists’ drawing processes, ‘everything you need to know about perspective’ books and ‘comprehensive anatomy’ video series and so on. Many of these are brilliant and extremely useful. Experts have so much information and skill, and they want to show it all to you, which is really generous of them, but there’s a couple of problems. But there’s a phenomenon called the ‘expert blindspot’, where experts forget all the steps – the temporary failures, bad practices and repetitions – that they needed to get through on their own journey. 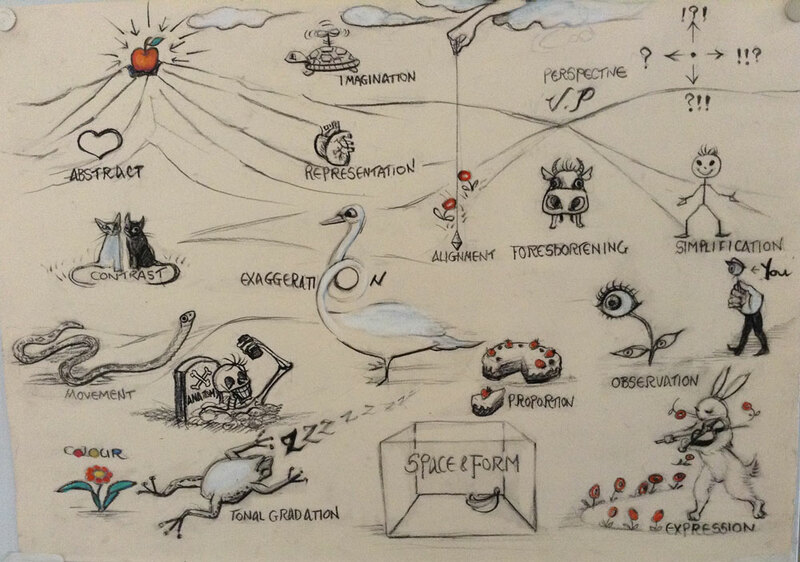 The second difficulty is that with so much knowledge out there, it’s easy to forget that you are also aiming to be expressive and go beyond just technique towards creativity. The freedom of your lines, your unique observations and your own aesthetic style can suffer if you’re consumed with technical knowhow and academic correctness. Mayko and I struggled with this as she tried to teach me – she didn’t realise all the little things I didn’t know, the steps I needed to take before I could learn more advanced things. Beautiful art demonstrations would leave me a bit inspired, but also lost when it came to actually draw. We have worked through that, and we’ve created this little beginner course, where we can take our first steps together at a challenging but doable pace, and have a good time while we do it. Learning to draw isn’t a sprint, or a marathon, it’s a big adventurous journey. We have a rough idea of where we want to go, but we don’t need to know every detail of the journey yet. We may be tempted to try to teleport straight to the destination, but a) it’s not possible and b) where’s the fun in that? We just need to start taking steps, and also know the next few streets to walk down. So what are those first steps? If you are at the start of the adventure, we would suggest you spend a lot of time learning to build your drawings, rather than print them. This means not trying to draw the figure in detail bit by bit, like a printer would. Instead, approach it like you’re building – start with a very rough plan, and then build a basic foundation. Then start to flesh out the drawing with a focus on the most important lines and shapes, still keeping things very simple. Finally, add the last little flourishes of detail. 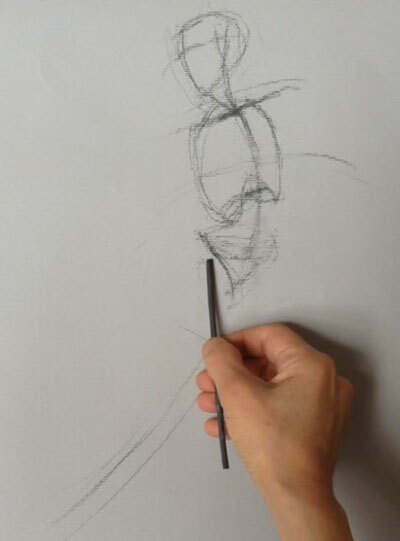 In other words, develop your observational skills so that you can simplify what you see into the most important shapes and lines, starting with the most fundamental, and simply and slowly adding layers with increasing levels of information in them. This building process is what this ‘first steps’ mini-course is all about. 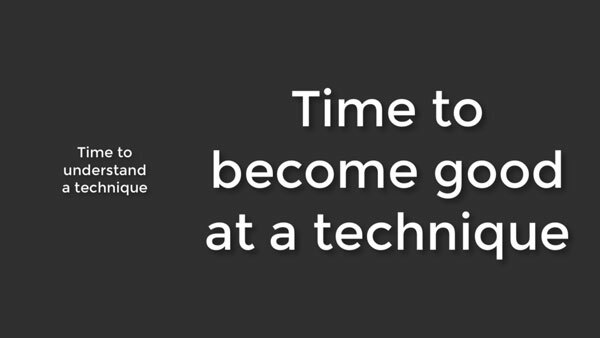 We are aiming to give you some doable technical advice, and coupling it with plenty of practice so that you can actually ‘get it’, before moving to the next step. It’ll only work if you regularly undertake the exercises we’ve designed for you. It’ll require a little patience, but we’ll be taking real steps pointing squarely at your goal together. Try not to rush the process. Each skill needs time and practise to develop. We are going to add more exercises and additional lessons to supplement this course, so be sure to stay up to date with what we’re making for you by subscribing to our YouTube channel, our newsletter below, our Facebook page and our Instagram page. Thanks for watching! Thank you so much for the tutorials and useful resources! I’m afraid I have binge watched quite a lot of them (I couldn’t resist) and have now built up quite a lot of practice debt. It is so inspiring nevertheless. I have never tried life drawing before. I used to think life drawing was ‘formal’ and boring, but your examples have shown it to be so fun and creative. Now I can’t wait to get started. Your videos and content are of excellent quality. I also love how short and straight to the point the videos are (especially good for late night binge watching). You website is similarly clean and clear too. I love your style. It all seems too good to be true that all this is available for free and ad-free. I’m just wondering, why you are providing this for free. Is this promo for paid online classes later on? I’m so incredibly happy that I found your YouTube channel and website. Not only has it helped me tons with great teqniques and exercises, but it has also helped me improve my mindset. Amazing videos and tutorials – keep up the great work! I think this is great and I am going to give it a go (I am a beginner, again). 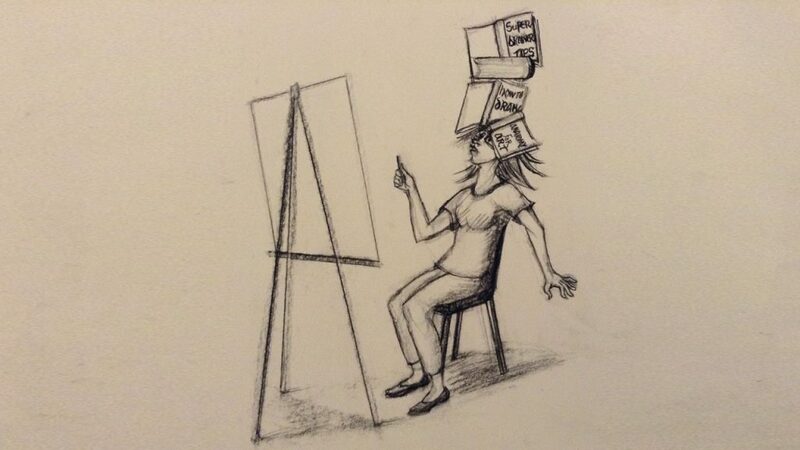 I have subscribed and received the ‘Life Drawing Success’ guide which sure has me pegged. My only question is I don’t seem to be able to log in? I can find no place to create a password and register. However, I shall begin the Beginner Course immediately. Thanks for this great resource. Thanks Don and good luck with it! The login is for an older course that’s no longer available. This beginner course is open and free to all, no login required.